My brother who still lives in the school district where we went to school in south central Pennsylvania, likes to keep me updated on the sports teams of the High School we attended. A few years ago, he told me the incredible story about one of the high school wrestlers who was making national news. He told me that this wrestler was 170 pounds and he had these incredibly thick wrists and legs built like telephone poles. During his high school career, he won four consecutive state titles and finished his High School career with an undefeated record of 166 wins and no losses. Since he was in the eighth grade, national journalists referred to him as the LeBron James of wrestling. I wonder if this is the kind of wrestler that Jacob faced in our scripture reading from the Book of Genesis. Up to this point in the story, Jacob has proven to be an excellent wrestler. He was able to wrestle away the family birthright and blessing from his brother, Esau and his father, Isaac. With the help of his mother, Rebecca he flees for his life and stays with his Uncle Laban. After many years, he decided to return home, but not after wrestling away the best of Laban’s flocks and resources. He will be using these gifts that he took from Laban as a peace offering to give to his brother, Esau. On his way to meet his brother, Jacob even sends his family ahead of him while he spends the night by himself. What happened to Jacob that night, gives new meaning to the phrase, “restless night.” It was more of a “wrestling night.” Jacob ends up wrestling with an unidentified man the whole night until daybreak. This mysterious wrestler is unable to pin Jacob down. He is no match for Jacob who has learned from his birth how to wrestle away whatever he wants and from whomever he wants. Sometimes our greatest strength can also be our greatest weakness if not used in the right way. Jacob may know how to get what he wants, but he has yet to learn what it means to get what God wants. God wants Jacob to continue to live out the faith that began with his grandfather, Abraham and continued with his father, Isaac. Jacob just isn’t there yet. He still sees himself as the man who can fool just about anyone, but he can’t fool God. Much is at stake at this point of the biblical story, because God does not have a plan “B.” God’s covenant to rescue the world from sin and death is dependent upon Jacob getting his act together. Jacob has only been thinking about himself. At this point, we’re left wondering if Jacob will ever quit tricking people and start trusting God. The all night wrestling match between this mysterious being and Jacob, interestingly enough takes place at Jabbok, which is located just across the border from the Promised Land and the place where God would establish his people. In addition to its geographical significance, the words, “Jabbok” and “Jacob” are very similar in sound. They both mean, “to wrestle.” It’s a play on words by the biblical author. A lot is at stake at this place called, Jabbok. This wrestling match lasted through the night and into the morning hours. I don’t think Jacob was expecting it to last so long. Rob Strauss, a professional wrestler said that the sport of wrestling is “a little like wrestling a gorilla. You don’t quit when you’re tired – you quit when the gorilla is tired.” Jacob’s opponent just would not quit. He gave Jacob everything he could handle and then some. Jacob eventually wins the wrestling match but not without paying a price. Jacob’s opponent ends up striking him on the hip socket and putting his hip out of joint. Even in pain, Jacob doesn’t let go of him. Jacob will not leave from this match without a prize. But unknown to him at the time, the prize will be something that will change the course of his life. Jacob’s prize was a new name. 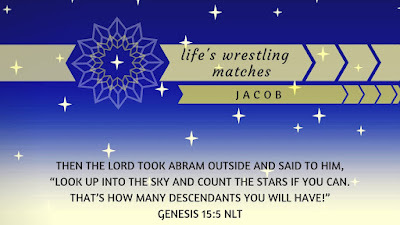 Instead of “Jacob, the wrestler” he will be known as “Israel,” the name that would one day refer to God’s chosen people. As a new day was beginning, Jacob received a new beginning as well. Instead of striving for his own benefit, he would now be striving for God and God’s people. Our story ends with Jacob limping away because of his wrestling injury. Now, we might not be a championship wrestler like the high school wrestler who ended up winning four state titles, but all of us experience life’s wrestling matches. From time to time, all of us wrestle with who we are and who God is calling us to be. Marcus Aurelius, the ancient Roman emperor once said, “The art of living is more like wrestling than dancing.” I think he was right. We live our lives more on a wrestling mat than we do on the dance floor. What are some of life’s wrestling matches that we face in our everyday lives and how can our faith help us? Here’s the first wrestling match we all face from time to time. It relates to our identity. Jacob was given a new name at the end of his wrestling match. From that point on, he was known as Israel. Jacob went from being known as the one who tricked people to get his way, to one of the leading patriarchs of our faith. When we are baptized, Christ gives us a new name. We become known as a child of God. We belong to Christ. That’s why we can call each other brothers and sisters in Christ. It’s because we all have the same last name. We are family. We are children of God. The good news of our faith is that we don’t have to figure out who we are. We already know who we are. We are God’s people. We belong to Christ. That’s our identity. Up until this point, Jacob was trying to be somebody that he wasn’t. Jacob thought that his true identity was related to the order of when he was born and he spent the first part of his life trying to be his older brother rather than Jacob. God wants us to be who we were created to be. What a freeing thought to know that we don’t need to try to be somebody other than who God created us to be. Jacob needed to be the best Jacob that he was created to be. We used to own three white West Highland terrier dogs before we moved here to Athens. We still have one of those three. Since we’ve moved to Athens, we’ve added another westie so now we have two of them. But when we had those three westies, people could never tell them apart because they looked so much alike. We could easily tell them apart even though they had subtle differences. We could tell them apart by how curly their hair was, by the sound of their bark, and by the way they walked. When God created us, he made each one of us unique. We each have a unique blending of personalities, interests, spiritual gifts, and passions. We don’t need to be somebody else because we already have everything we need. There will be times when we will forget who we are, so let’s remind each other of our identity. Another wrestling match that we face in life is related to our priorities. It’s pretty clear that Jacob’s priority was to do whatever he needed to get ahead. His priority was not to live out who God called him to be. Sometimes, we get our priorities out of order. We forget what is most important in our lives. 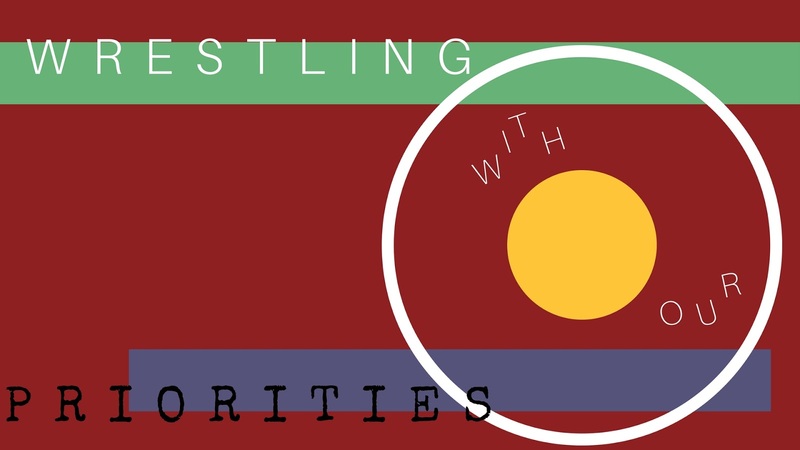 Keeping our priorities in the right order is often a wrestling match especially since there is so much competition for our time and attention. We want to do what is most important but so many things can come at us at the same time. I remember trying to use a numbering system to help me prioritize my responsibilities. Even though I had good intentions, I discovered that most of the time I was responding to the urgent rather than working on what was most important. It seemed like I rarely had enough time to focus on what I believed to be the most important things in my life. What are those important things in your life? Your relationship with God? Quality time with family and friends? Making a difference in our community and world? Remember to put first things first. A third wrestling match that we face in life is related to our stewardship. Stewardship involves how we manage our resources. Up to this point in the story, Jacob used his resources for his own benefit, rather than for how he could be a blessing to others. I was having breakfast with a friend this past fall. Somehow, we got on the discussion of giving to the church. He said that early in his marriage, he and his wife wrestled over the decision on how much of their income they should give to the church. Their ultimate goal was to begin tithing and giving 10 percent of their income to Christ and his church, but that just seemed like a lot of money. He said how they were at a standstill so they decided to pray about it. Soon after they prayed about what to do, they went to the Bureau of Motor Vehicles to get a license plate for their car. You can’t make this up folks. Here is the license plate the BMV randomly gave to them for their car. He actually sent me this picture of it because he and his wife couldn’t believe their eyes. Friends, this wasn’t even someone else’s vanity plate even though that’s what it looks like. This was just the next number for them to take. Now, that’s amazing! This is what we have been calling a “Thin Place Moment,” a God moment like no other. Well, needless to say, they saw this license plate as God’s answer to their prayer about giving. Give 10%. And that’s what they started to do. And after all of these years of marriage now with children and now grandchildren, they continue to give 10% toward the work of Christ and his church. And they continue to tell this story of how God answered their prayer. How we manage our money and resources is something that we wrestle with all of the time. How much should we spend and save for ourselves? How much should we give away to be a blessing to God and the church? Jacob’s wrestling match led to a change in his life. Instead of using his resources for his own end, he began to offer what he had for God’s purposes. God calls us to be generous in our giving. This brings us to the fourth wrestling match that we face in life. This is related to our legacy and what do we want to leave behind. If Jacob wouldn’t have turned toward God, we would probably only remember him as someone who tricked others to get his way. Thankfully, we also remember Jacob as the one who became the father of the twelve tribes of Israel. It was through Jacob that God’s covenant to rescue the world from sin and death was able to continue. Jacob was able to live out what began with his grandfather, Abraham and his father, Isaac. How do you want to be remembered? We won’t be here forever but our legacy will live on. The decisions we make today add up to the legacy that we will leave behind. The good news is that we don’t wrestle alone. God is by our side during every match. Whenever I struggle with a decision or feel like I’m wrestling with something in my life, I think of Jesus who came to save us from our sins. Jesus learned to wrestle whenever he faced important decisions regarding his identity, his priorities, his stewardship, and his legacy. On the night before he died on the cross for our sins, he faced his own wrestling match as he prayed for God’s will to be done. He died on a cross, but then he rose again and offers us forgiveness, hope, and new life. This story reminds us that we don’t wrestle alone. The one who gave it all is right there with us and will never let us go. 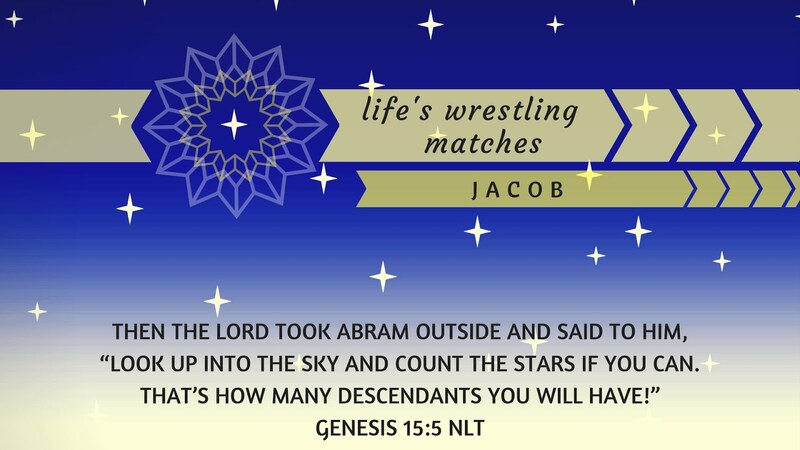 Our summer long Genesis sermon series brings us to this story of when Jacob has a wrestling match with God and walks away limping, but also with God’s blessing. 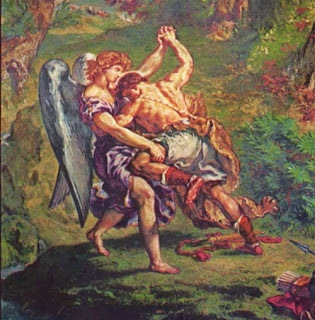 The wrestling match takes place as Jacob is on his way to make a peace offering with his brother, Esau who he had cheated to get the family birthright. Pastor Robert shared four wrestling matches that we often have along our faith journey that ties in with the story of Jacob. These include wrestling with our identity, our priorities, our stewardship, and our legacy. Share when you have wrestled with God over one of these four areas of your life (identity, priorities, stewardship, & legacy.) Did it lead to a blessing? Did it leave you limping? The story of Jacob wrestling with God concludes with an assuring word that God will always be by his side. When have you felt God by your side during a time of wrestling in your life? Eternal God, in the midst of our fears and doubts, you call us home. Be with us on our journey when our faith wavers and we seek safety in our own clever schemes. Stay with us especially when we stray from you. Forgive us for our waywardness in being the people you have called us to be. When we turn away from you, show us the path that leads to life. As you did for Jacob so long ago, bless us in our struggles so that we might be a blessing to others. In the name of Jesus Christ, we pray. Amen.